Those awaiting results of the January 2016 Architect board exam also known as Architect Licensure Examination (ALE) can find here the full list of passers, top 10 (topnocthers), top performing schools and performance of schools as the Professional Regulation Commission (PRC) and the Board of Architecture (BoA) released results in 5 working days after the last day of exam. PRC on Friday, February 5, 2016 said that 866 out of 1,556 passed the Architect Licensure Examination. 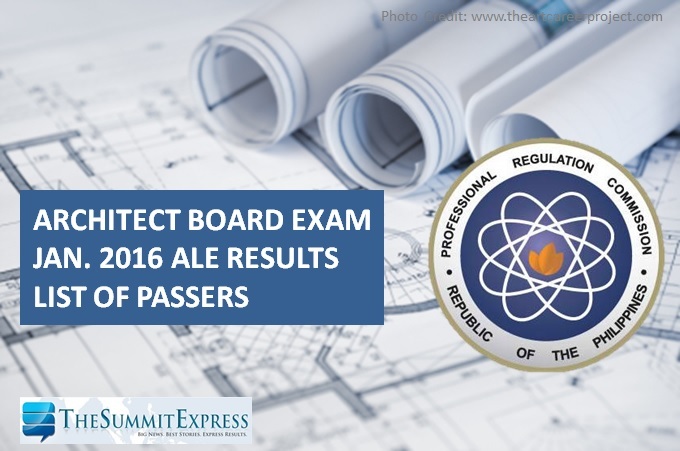 PRC conducted the Architect board exam on January 29 and 31, 2016 in the cities of Manila, Cebu and Legaspi. The Board of Architecture who gave the licensure exam is headed by its Chairman, Arch. Rolando L. Cordero and board member, Arch. Fidel Jose R. Siapno. In June 2015, results were released in 4 working days after the last day of exam. 867 out of 1,428 successfully passed the Architect Licensure Examination (ALE).